Orchestrating an ideal first look is something that we've taken pains to master over the years. The moment when the couple first sees each other is a personal time when all else fades away, and the timing, location, and lighting need to be considered in advance so as to not only minimize distractions from well-meaning friends, family members, or guests, but also to provide the most beautiful location for images documenting these moments. Many modern couples decide to have a first look to simplify their day's timeline; still more opt to have a first look so that they can have a few precious minutes alone together before being bombarded by their loved ones for the rest of the day's festivities. We love the portrait opportunities a first look affords, along with the ability to capture excited faces, kisses, and sweet conversations that would be difficult to take place with an aisle reveal (where the couple sees each other for the first time at the ceremony). Many weddings simply do not have the time after the ceremony to still capture all the portraits the couple would like to have and still join their party. First looks also enable the family formal portraits to be taken prior to the ceremony, leaving everyone free to head straight to cocktails following the nuptials. 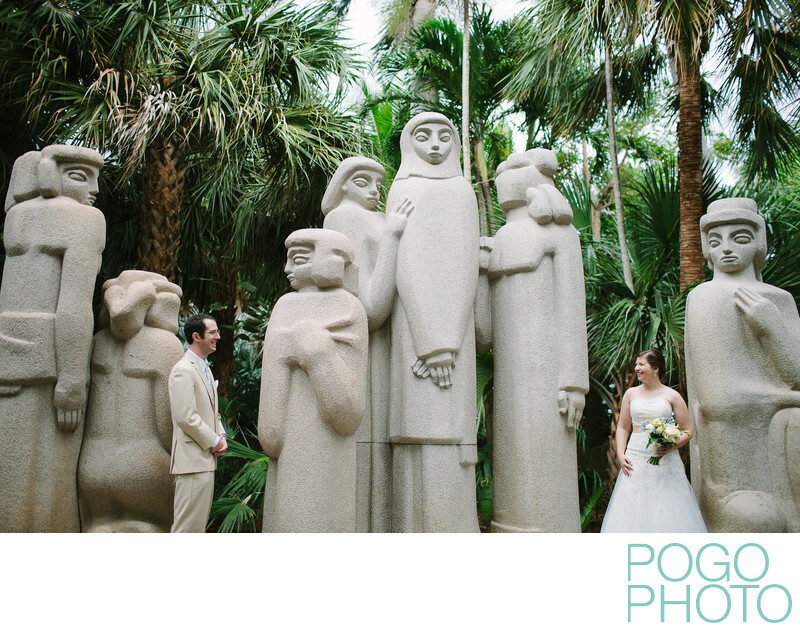 This first look took place on site near where the ceremony was slated to take place, at the Ann Norton Sculpture Gardens in West Palm Beach, Florida. Nestled amongst residential streets, this beautiful venue has endless beautiful opportunities for portraits, but these towering sculptures are one of our favorite places for incorporating the look and feel of the gardens with an ideal spot for the couple to encounter each other naturally, without a lot of staging or fuss from our end. We positioned Anna between the sculptures on the right, led Mike to his position on the left, and gave them a signal to walk out and see each other once we were both ready to shoot. Their beaming smiles show their pleased excitement for the rest of the day ahead. 1/640; f/2.0; ISO 100; 35.0 mm.